The Tampa team that will take on the NHL this season is far different than the one that ended the last campaign. New owner, new GM, new coach, even some new players. All that newness is certain to go through some growing pains but the pieces that are in place were hand selected and quite capable at filling their new positions. I mean, c'mon, Steve Yzerman is the new man in charge and Stevie Y can do no wrong in my book. Sure I was less than happy that his handiwork with Team Canada resulted in a USA loss in Vancouver but let's face it, the Americans just weren't as good. In just a few weeks of work, Stevie Y has all but ensured that Tampa is a far better team than last season - one that the Rangers will have to be quite wary of. Familiar Foes: No matter how many times he was traded in the Montreal media, Vinny Lecavalier remains a member of the Lightning. 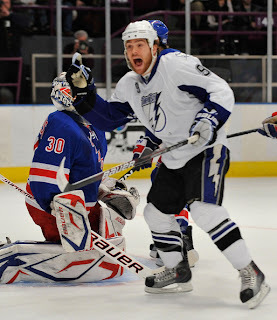 Ryan Malone and Marty St Louis also remain, as do Tampa's top picks Steve Stamkos and Victor Hedman. Steve Downie Syndrome showed last season that he can retain a modicum of sanity and play a big part in the offense. N00bz: Stevie Y was quite busy changing the culture and giving Guy Boucher the pieces he needs to improve the quad. First and foremost is Simon Gagne. If the former Flyer can keep the concussion symptoms at bay, he could play the triggerman on a new French Connection with Vinny and Marty. Pavel Kubina came back to feed the forwards and keep the heat off of new netminder Dan Ellis. No matter what problems Ellis has, stopping the puck hasn't been one and he should all but send incumbent Mike Smith out of town. Brett Clark was also added to help shore up a pretty thin defense. Up front familiar face Adam Hall will be joined by two other former Rangers - Dominic Moore and Mitch Fritz - and old foes Nate Thompson and Sean Bergenheim from the Islanders. The common thread running through the five former New Yorkers? Toughness. They will add the grit while the French folks and that Stamkos kid take care of the skill. Somewhere in between is Carter Ashton. Brent's boy is big - 6'3, 215 - and could make quite the impact in the NHL but with Stevie Y in charge, he is likely to head for the AHL for some seasoning (as Yzerman's old team did with most every prospect ever). This Year: Wednesday, November 24th in Tampa; Thursday, December 23th at MSG; Saturday, January 1st in Tampa; and Sunday, February 27th at MSG. What They Mean To Blue: The Bolts should be one of the teams taking on the Rangers for one of the lower playoff seeds. Seeing as the Blueshirts went 3-1 against them last time around - including that amazing 8-2 beating - this season should see them as a far more difficult opponent.